Every month on the last Saturday. Open to all late models, trucks and Jeeps, and includes coffee and donuts, and a canned food drive for the All Faiths Food Bank. Every month on the fourth Saturday (except for December). All vehicles welcome…domestics, Euros, imports, hot/rat rods, classics, exotics, luxury, sports cars, muscle cars, cycles & more! * No burnouts or reckless driving of any kind! * We DO NOT condone street racing! Every month on the last Saturday. Hosted by Detail Garage Tampa, the auto detailing supplies superstore which offers Chemical Guys Products. Coffee, doughnuts, sales, raffles, music, giveaways, cool cars and cool people. Every month on the fourth Saturday. Hosted by the Clay County Cruzers. Open to all years, makes and models. Every month on the fourth Saturday. 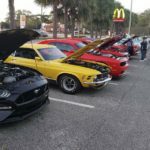 Please come out and join us for the monthly Winter Garden Cars and Coffee. We will be meeting in the parking lot next to Village Inn at “The Grove”. Please be mindful as no revving or burnouts will be tolerated. Please let’s make this a big meet and all have a good safe time. Hosted by the Volusia Region AACA. B eautiful location in Lake Helen’s Blake Park – plenty of shade, a large covered pavilion, music by Laurie, Queen Of The Hop, great food, awards & cash prizes, (including 15 $50 bills). Open to all makes & models. Pre-registration is $15 by April 6. Registration form HERE. Every month on the last Saturday. All makes and models welcome. Coffee and breakfast pastries will be provided. Every month on the fourth Saturday, except July, Aug, Nov, Dec. Hosted by the Villages Antique Automobile Club. All vehicle makes and years welcome. Trophies, food, DJ music and value cover racing. Proceeds will benefit John Hopkins Children’s Hospital. 28 trophies and $250 prize to the best club participation. Gift basket raffles, 50/50, music and food and drink available for purchase. Every month on the fourth Saturday. Hosted and music by Lance’s Cruzin to the Hop. Trophies, prizes, food and lots more. Enjoy Sommer’s great breakfast buffet. Presented by the Rotary Club of East Lake Sunrise in conjunction with the YMCA’s Healthy Kids Day. All money raised goes to charity. Open to all show car and trucks. DJ music, live entertainment, and various activities for the kids throughout the day. Food, raffles, and more. Over 60 trophies awarded. Registration 9- 11am. Fun for the entire family. View additional information flyer HERE. This event is the newest Concours in North America and will feature the following marques and special classes among others: Studebaker, German Engineering, American Classics, and zdditional features to be announced soon. The Concours event weekend kicks-off with an outdoor celebration at sunset on the lawn with the backdrop of beautiful Paynes Prairie. Attendees are invited to bring their lawn chairs for an evening of music and entertainment. Saturday will be a 9-11am cars & coffee. Art exhibits will be scattered through out the automotive displays. There is a special kids area and vendors offering food and beverages. A Grand Gala, black tie affair, 6pm-midnight will featuring “The Voice” contestant Natascha Bessez and local talent Elio Piedra. Entry to the concert is limited to car entrants, VIP purchase, chairman’s club purchase, sponsors and Gainesville country club members. Sunday is Concours Day with judging and awards. Celebrate America’s passion for the Automobile at the inaugural AAA Auto Expo in Heathrow/Lake Mary. Join us for fun and friendship and share your ride with other drivers who share your love of cars. Come check out cars you’ve loved – and cars you’d love to have – or bring your own classic car, sporty sedan, work in progress to put on display. Give-aways, free admission, display our car for free. First 250 drivers displaying their cars will receive a collectible event hat & sling pack goodie bag, while supplies last, plus commemorative dashboard plaques for all cars on display. Register to win a Royal Caribbean Cruise 5 night cruise. Flyer HERE. This show is open to all vehicles, cars and trucks. The first 150 to register will get goody bag and dash plate. There will be 13 trophies + child’s choice. So sign up early to get your dash plate. This show is a fundraiser for Sunshine State Superkids. Sunshine State Superkids is a FREE program for special needs children, under-privileged children and all other children. Sunshine State Superkids supplies all the cars, equipment, food and awards at the end of the day. SSS does 8 events a year through out the Central Florida area. Hosted by the Asphalt Angels. Car show will be on the east end of the mall parking lot, outside the food court area, near the valet parking area. Door prizes, 50/50 raffle; trophies awarded at 1:30 pm. Proceeds will benefit the Gary Sinise Foundation. Open to all years, makes and models. Special guest appearance by Richard Rawlings from Gas Monkey Garage and star of Discovery’s Fast N’ Loud. Trophies for Best of Show and People’s Choice. Music by Tom’s Traveling Tunes. Sponsored by Williamson Cadillac. This event will be featuring antique, muscle and super cars plus delicious burgers courtesy of Shula Burger. Bring the whole family to see the collection and meet like-minded car enthusiasts. This is a FREE community event. Registration form HERE. Every month on the last Saturday. Hosted by Dee’s Road Rascals. Who is ready for the old fashion sock hop’s and the ordering from the car. Time to lace up those skates, load up the kids, and bring them on out as we light up the night at Sonic. DJ music, trophies, and vote for the one you love. Every month on the fourth Saturday. PizzaBoyz pick trophy, door prizes, 50/50 raffle, and 50’s & 60’s music. Rain or shine. Every month on the fourth Saturday. Sponsored by the the Eustis Business Alliance and the City of Eustis. Hosted by Jan and Marty. Music by WJBJ, shopping and dining opportunities. Lots of cars and trucks, great sponsors, CASH prizes, and a 50/50 drawing. Every month on the last Saturday. Hosted by the Tallahassee Street Rodders. All years, makes and models are welcome. There is a 50/50 drawing. Open to all classic, custom, or cool. 10% discount inside the brewery for rides in show field. Food truck, MC/DJ Rockin Rich Bedford, LIVE broadcast on www.rollbackradio.com, $25 “Monks Gift Card” to managers choice near conclusion. Great crowds this past September and December. Free to attend. Every month on the fourth Saturday. Free pizza and soda if you bring a show car. Door prizes, plenty of shade and DJ music by John Paul Gasca playing the hits from retro to right now. Come enjoy the fun. Every month on the 4th Saturday. Open to all years, makes and models. DJ music and awards.